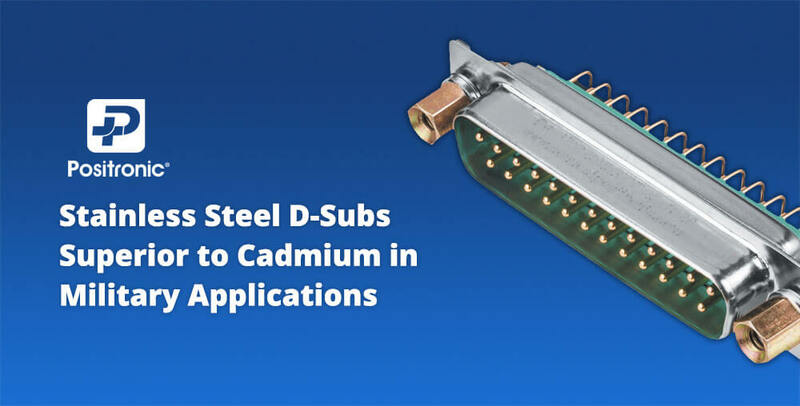 The Merits of Stainless Steel D-Subs over Cadmium in Military Applications » Electronic Salesmasters Inc.
Positronic is one of only a few companies that use stainless steel in their D-subs. In the world of high performance electronic connectors, Positronic uses a variety of stainless steels. Much of it is in the premium 300 series – common alloys like 302, 304 and 305. They’re all high quality, with only slightly different characteristics. The 304 alloy is the most widely used stainless steel in the world. You can find it in everything from cars and knives to the space shuttle. It’s also known as food grade. It’s weldable, machinable, and has high resistance to corrosive chemicals and harsh atmospheres. Positronic parts made of stainless steel still need further processing. They call it the passivation process, making the surface passive and non-reactive. When you’re fabricating something out of stainless steel, you have to recognize that it has pores. Iron particles can find their way into the pores, introducing rust and corrosion. The passivation chemical wash clears everything out, ensuring maximum corrosion resistance. Our customers have a lot of military and defense applications, and in many of these cases, they understand that the highest quality stainless steel is superior to cadmium-plated solutions. We see stainless steel as superior to cadmium for many applications, and the good news is that the price is now on par. There used to be a big differential, but we’ve seen improvements in both stainless quality and pricing over the last 15 years. Positronic is not the only manufacturer making stainless steel connectors, but they do offer the greatest variety of stainless solutions in the industry. D-series connectors are produced by hundreds of companies. But Positronic is one of only a few companies that use stainless steel in their D-subs. Positronic is the sole source for many connectors using stainless steel. True, they also supply cadmium for certain military applications and tough environments. But they love stainless steel – the metal that does not corrode, the Archangel alloy that heals itself under fire. Its qualities are nearly miraculous, and its cost is comparable to would-be competitors. You might say stainless steel is the shining hero of the Positronic catalog.